I know that the White Sox are currently 32-33 and only 3.5 games out of first place in the AL Central, but even with my history of being unreasonably optimistic about the White Sox, I’m not expecting this team to compete for the postseason this year. I just have a hard time believing this team, with no real bullpen and a starting rotation that’s actually relying on Hector Noesi, is going to contend for the long haul. Hell, they’re in the race now, but they haven’t even won as many games as they lost. A bad division can make a team look better than it actually is. But this team isn’t a playoff team. It’s a much better team than 2013, and it’s a lot more enjoyable to watch — THESE KIDS JUST DO NOT QUIT — but October isn’t happening in Chicago this year. In fact, the team we see in September probably won’t be the same as the one we’re watching now. I still expect the White Sox to be sellers come the trade deadline, and one of the players I feel has a good chance of being moved is Gordon Beckham. We’ve waited a long time for Gordon to get his act together after showing so much promise as a rookie, and now that he has, it’s the perfect time to move him. Say what you want about the White Sox farm system, but if there’s one area that’s a strength, it’s infielders. The Sox have plenty of options down on the farm, and a logjam at the Major League level. In fact, things were so cramped that even after Marcus Semien was sent back down to Charlotte, there still weren’t enough spots for the infielders the Knights had. That’s why Semien has been spending time in the outfield in recent games, because they’re looking for a place to put him to make sure he’s getting the at bats he needs. Not including recent draft pick Carlos Rodon, the top prospect in the system right now would probably be Micah Johnson, who plays second base. 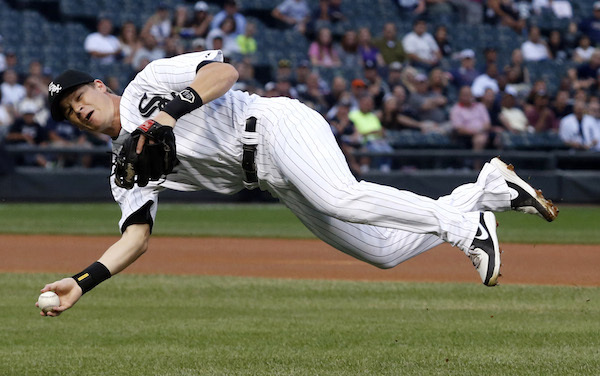 All of which means that, even if the Sox aren’t true sellers come the deadline, there’s a good chance that Gordon Beckham will be moved. In fact, considering how well he’s played recently, moving him sooner rather than later might be the smarter play. Especially when you consider there are plenty of contending teams that have a weakness at second base right now. Oakland, Atlanta, San Francisco and St. Louis are four teams currently in postseason contention. They’re also four teams that find themselves ranked in the bottom six MLB teams when it comes to OPS from the second base position this season. The Athletics have the best record in the American League at 39-25, yet this season they’ve had both Eric Sogard (.195/.265/.233) and Nick Punto (.245/.350/.311) splitting time at second base. Punto has an OBP of .350, but against lefties that number drops to .297 this year. Plus he’s 36 years old. He’s not really an every day answer. In Atlanta the Braves have managed with a trio of Dan Uggla, Tyler Pastornicky, and more recently, some guy named Tommy La Stella. Those three have combined to hit .200/.278/.282 from the second base position. Giants second basemen (mostly Brandon Hicks) are hitting .176/.264/.315. In St. Louis the classiest second basemen in all of baseball are also some of the weakest hitting, putting up a line of .214/.289/.269. Those numbers are a bit misleading, though, as Kolten Wong has been a lot better since May began, so I don’t think the Cardinals would be all that interested in Beckham. Why not trade for him? Let’s take a look at what Rick Hahn and the Sox could potentially ask for from each of the three teams. I have no idea why Oakland traded for Jim Johnson this winter, because paying $10 million for a closer seems like the exact opposite of something Billy Beane would do, but Beane did it. I think maybe Oakland traded for him just to have him around in July when other teams would be overspending on late-inning relievers with “closing experience,” but I can’t say for sure. As overrated as the save stat is, Johnson did have 101 in the two seasons before this one. He’d bring some much needed late-inning experience, and if Oakland is willing to pay most of his salary, Johnson is a free agent at the end of the season, so there’s no long-term commitment. Of course, I’m not willing to do this trade straight up as a Johnson-for-Beckham. Maybe if the Sox are willing to pick up some of Johnson’s salary — they would be saving some of the $4.175 million owed to Beckham this season — they can get Oakland to add a prospect as well. Looking at Oakland’s farm system, a couple of names I see that intrigue me that I think Oakland can be convinced to part with are righty Dylan Covey and first baseman Matt Olson. Covey was a fourth round pick in last year’s draft out of San Diego — he played with Kris Bryant — and he has fantastic stuff, it’s just the results he’s gotten have never matched it. We’ve seen the White Sox help guys with good stuff and no results find those results before, and maybe Covey is somebody that could be developed into a reliable starting option down the road. As for Olson, now, obviously, first base isn’t exactly an area of need for the Sox, but I like quite a bit about this kid. He strikes out quite a bit, but he also hits for power and gets on base a lot. So far this season at High-A Stockton Olson is hitting only .238, but he has an OBP of .387 and is slugging .481 thanks to 15 homers and 12 doubles. He’s also cut down a bit on the strikeouts. Last year he struck out 148 times in 558 plate appearances (while drawing 72 walks) for a K rate of 26%. This year it’s down to 20%, as he’s struck out 60 times, and his walk rate has climbed from 13% to 19%, so he’s showing a better command of the strike zone. With Paul Konerko about to retire, Adam Dunn on his way out of town, and Jose Abreu likely destined for the DH role in the future, the lefty-hitting Olson might be a valuable commodity down the road for the Sox. I don’t know how eager the Braves would be to make a deal, as they may just want to give Tommy La Stella a chance to ease any fears about the position. So La Stella could get an audition for the role, but if he struggles (and through 10 games, he isn’t, hitting .364/.417/.364) it’s possible the Braves may look for an upgrade around the trade deadline. Maybe that’s when Beckham becomes more appealing. As is normally the case, Atlanta’s system seems a bit pitcher-heavy, though there isn’t a top prospect in the normal sense, but there is depth. Depth the Braves may be willing to part with in order to improve the MLB club. I’m not sure they’d be willing to give up on him, but catcher Christian Bethancourt is an interesting possibility. Scouting reports on his hitting ability vary, but most seem to believe he’ll be solid defensively no matter what. As far as pitching, the Braves have a tiny little righty named Shae Simmons that could prove to be an effective late-inning reliever down the line. Baseball America says Simmons has the best fastball of any pitcher in Atlanta’s system, and though he’s still at Double-A, he’s using that fastball rather effectively. In 101 minor league innings the former 22nd round pick in 2012 has struck out 148 batters, or 13.2 per nine innings. While he wouldn’t be able to get by on a fastball alone in the bigs, that’s the kind of arm the White Sox could work with and develop into something. The Giants have a ton of pitching in their farm system, and if I’m Rick Hahn, the first player I’d ask about is Kyle Crick. Then, when Brian Sabean is done laughing and is in a cheerful mood, I’d begin sniffing around other possible targets. Andrew Susac is a catcher (can you tell I’m not high on the current White Sox catching corps?) the Giants took in the second round in 2011, and while nobody would call him a Gold Glove defender, he is improving behind the plate. What I really like about him is his work with the bat. Last year at Double-A Richmond Susac managed a line of .256/.362/.458, and he also showed a good sense of the strike zone, drawing 42 walks to go with his 68 strikeouts. This year at Triple-A Fresno he’s improved. Susac is currently hitting .296/.395/.531, and while the Pacific Coast League is notoriously hitter-friendly, those are still impressive numbers. If looking for a pitching prospect that may not be highly-touted, but could project to be a mid-rotation starter down the line, Chris Stratton and Clayton Blackburn are two righties with potential. Both seem to have taken a step back this season, but still carry the same potential. Another player I’m interested in is outfielder Mac Williamson. At 23 he’s a bit old to still be in High-A ball, but he’s shown an ability to hit everywhere he’s been so far. In a season plus at High-A he’s hit .296/.382/.504 with 28 homers and 38 doubles. He strikes out a bit much, though he balances that with walks. My other concern is that at 6’5 and 240 pounds I’m not sure he’s going to stick as an outfielder, at least not one who’s a plus defensively. Could be destined to be a 1B/DH type should he ever reach the Majors. And those are just some possibilities. For all I know Beckham may be a lot more valuable on the trade market than I believe he is, and he could be worth more than the players I listed as potential targets. Odds are we’ll find out just how valuable a trade commodity he is at some point over the next seven weeks. This entry was posted in Chicago White Sox and tagged Adam Dunn, Carlos Rodon, Gordon Beckham, Hector Noesi, Jose Abreu, Marcus Semien, Micah Johnson, Paul Konerko, Rick Hahn, Trade Rumors by Tom Fornelli. Bookmark the permalink.